Thirty-six hours in the Bella Coola Valley, British Columbia. Stephen Wilkes made the 50-image composite with a Z 7 and an Ai Noct NIKKOR 58mm f/1.2. The f/stop was set at f/8; the shutter speed varied according to the light and the motion in the scene—"but I tried never to go below 1/60 second," he says. "And if needed to, I'd ramp up the ISO as far as 3200." The chances are good that however you think this picture was made, it wasn't. It's not a unique image—Stephen Wilkes has made over four dozen in locations around the world using more or less the same technique to more or less the same effect. But like the others, it is an exceptionally creative composite made by an extremely clever photographer. What you're looking at is one of Stephen's day-to-night images, for which he carefully chooses locations and vantage points, gets the required permissions to access and occupy those vantage points and then, for anywhere from 24 to 36 hours, takes pictures—a lot of them. 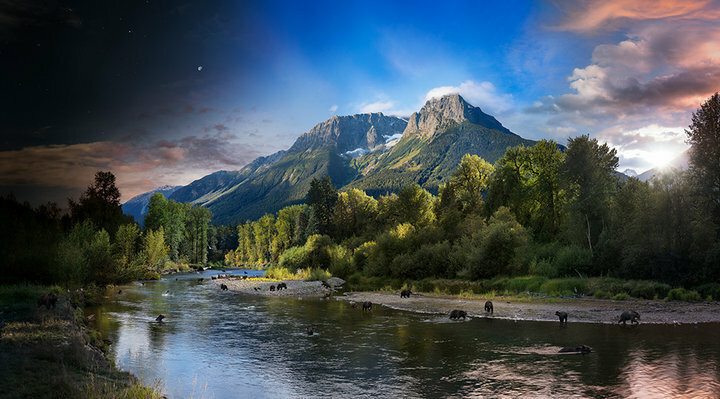 For this image of 36 hours in the Bella Coola Valley of British Columbia, he took 4,000 photographs, ultimately selecting 50 from which to make the composite. This is not a time-lapse composite, not in the usual sense. Stephen's camera—a Z 7—was not set to automatically click off frames at pre-selected intervals. Stephen stood on a specially constructed scaffold and photographed as bears, ducks, bald eagles, assorted waterfowl and tourists in boats came and went as time passed and the light changed. He took the photos when he decided the light and the moment was right. His judgments—while he was on the scaffold and later, in post production, when he chose the images to assemble into the composite—were made in an attempt to both express and compress the experience of being there. With Stephen was his assistant, Lenny Christopher, who worked at a laptop pre-assembling groups of images, all the while keeping an eye out for approaching bears. And there was one—a big one. We'll get to that, but first, how the day-to-night idea came to be. In 1996 Stephen was hired by Life magazine to photograph the cast and crew of Baz Luhrmann's Romeo + Juliet. The assignment was specific: get everyone in a single panoramic image, which meant that the location for the photograph—a squared-off film set—was a big problem. Stephen solved it by shooting 250 individual images—in effect, slices of the set—then gluing them together to create what he called "multiple moments in one picture." Years later an assignment to photograph Manhattan's High Line gave Stephen the chance to use the slices-of-life idea again, only this time Adobe Photoshop replaced scissors and glue to deliver the day-to-night activity of the High Line in a single image. Soon the idea became a personal project, for which Stephen has so far created over 55 day-to-night images. Not too long ago, the clever folks at Nikon wondered what would happen if Stephen and his day-to-night project were teamed with a Z 7. The resolution captured on the print is insane. Regardless of my technique and its expansion, the camera was totally capable of producing an astounding print, a jaw-dropping image of incredible clarity and detail. "The timing was right," Stephen says of Nikon's idea. "I was committed to the location—I'd learned that Bella Coola was likely the largest area where grizzly bears hang out, and it was stunning in the fall." First, what could be controlled was brought under control: Stephen secured the cooperation of Bella Coola Valley officials and park rangers as well as assistance from nearby Tweedsmuir Park Lodge. There were two wild cards: the weather and the bears. Stephen and his crew dealt with the weather by studying forecasts and moving the shoot up a day to beat an approaching front. The bears were a tougher challenge. They're tourist attractions in Bella Coola Valley, so they're used to seeing people, but they're still wild animals; they're territorial and the valley is their territory. They come to feed and they bring their cubs. "You gotta be looking around all the time. It’s a dynamic situation," Stephen says. "They swim very fast." For protection, a wire perimeter ringed the 15-foot-tall scaffold that was built on the Tweedsmuir Park Lodge's property at the river's edge. Stephen and Lenny carried walkie-talkies and last-resort cans of spray. And there were rules: no food, stay calm, don't show fear and if a bear approaches, start talking. "A ranger warned me that if a bear closes within eight feet, you begin talking to it," Stephen says. "You don’t ever look a bear in the eye, but you acknowledge it: I see you, I know you're there, you know I'm here. You show deference, you show that you're submissive. The ranger also said, 'You don't have fear.' "
All went well until about halfway into the shoot, when the incident of the potent lozenge occurred. Stephen tells it best: "We have no food with us because bears are sensitive to its presence, but Lenny finds two lozenges in his pocket. We’ve been there about 18 hours, just drinking water, and he says, 'Look what I got. Want one?' And after 18 hours I'm so focused on making photographs that I forget about the rules that you don’t eat anything, and especially not a candy with eucalyptus and honey and a very strong fragrance. "So right away I hear a sound over my shoulder, and I see a monster of a bear moving through what looks like six-foot-tall grass towards us. He stops about nine feet away, and his head goes up and he's sniffing the air, curious about what he smells. I know that at nine feet he can close quickly, but he's not seeing us, not yet. His nose is in the air, but we're above his line of sight. "My fear is so great I'm not getting enough air to speak, so I elbow Lenny. Finally I say, 'No fear...don’t spray...just watch.' The bear is still smelling the air and it dawns on me—the lozenges! That's what the bear wants, we've got to get rid of them, but before we do, the bear seems to relax and get bored with sniffing the air, and he walks away a bit, like he's just decided he's going to find some berries to eat. And he walks into the frame of my picture on the left side. I make a bunch of pictures, and then we throw the lozenges into the water, and the bear moves on up the river. "At one point he was as close as six feet, right at the edge of the wire fence. At full extension, standing up, he was huge, and with these Freddie Kruger claws." It was their only close call. The picture began at night as Stephen moved the camera left to right, sometimes up and down. He expanded his usual day-to-night photo technique to get the resolution necessary for the assignment, which was to create a 50 by 92-inch exhibit print. "The resolution captured on the print is insane," Stephen says. "Regardless of my technique and its expansion, the camera was totally capable of producing an astounding print, a jaw-dropping image of incredible clarity and detail." The lens fitted to the Z 7 with the Mount Adapter FTZ was an Ai Noct NIKKOR 58mm f/1.2. Stephen used a Really Right Stuff ball head on his tripod, "which allowed me to shoot a panoramic with a single nodal point. Basically I create a background plate based on actual time, and the best moments get seamlessly blended into that background plate." It's a complicated technique that often involves months of post-production in addition to all the planning, preparation and patience the making of an image requires. But it’s all worth it for Stephen, who considers that his day-to-night composites capture no less than "the flow of life—the way everything interacts over time." Fine art, editorial and commercial photographer Stephen Wilkes is an explorer of ideas whose images have been published in The New York Times Magazine, Vanity Fair, Time, National Geographic and Sports Illustrated as well as numerous other publications. A collection of his day-to-night images is featured in the Fine Art section of his website, stephenwilkes.com. Google "Stephen Wilkes TED Talk" to learn more about the project. Day to Night, a book of selected project images, is scheduled for Spring, 2019, publication.